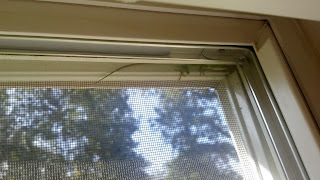 I was sitting at my computer this morning when Kat started going crazy at the window behind my desk. She was trying to get something near the top of the window. I was worried that she was after another paper wasp. Luckily, it was only a lizard. It wasn't until I took this picture that I noticed it was inside and not outside where he belongs. 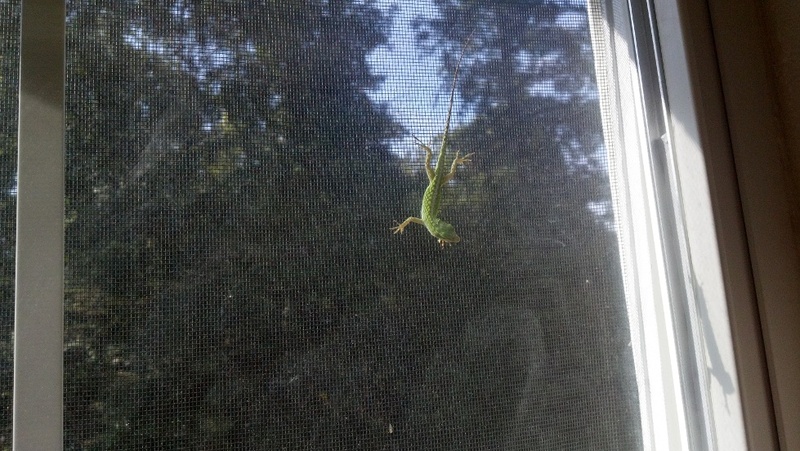 I wonder how long it was trapped between the screen and the window. 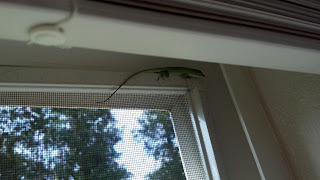 The lizard didn't seem to have any intentions of finding a way out, possibly because it was quite recently terrified by the cat. Joe was still asleep so I had to figure out how to trap the lizard and put it outside by myself. 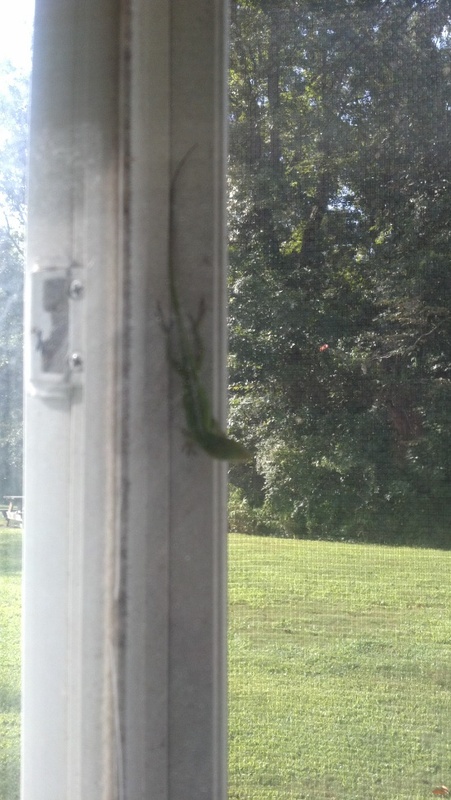 I tried to open the window a bit and the lizard ran to the center of the window. This was when I realized Kat needed to be locked in a different room. Lizard was not on the menu today. 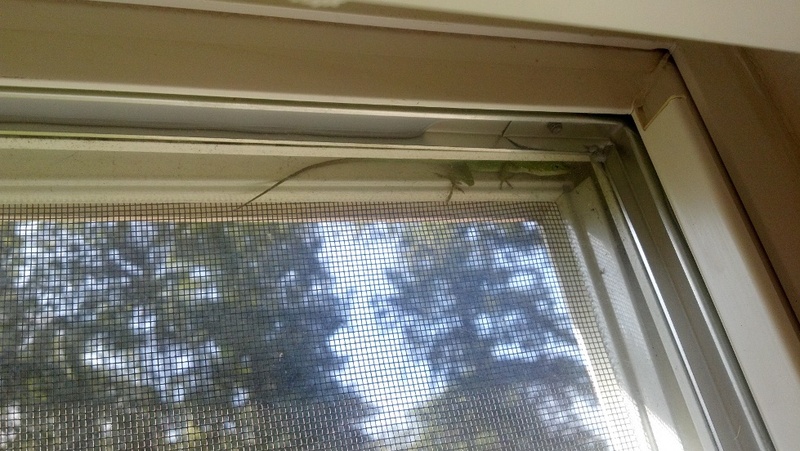 When I opened the window, the lizard ran to the other side to stay behind the glass. I tried to pop the screen out, but I couldn't get it loose. 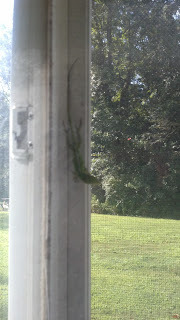 I had a plastic jar that I was trying to catch the lizard in, but it moved too fast. I had to run to the kitchen to get one of the empty cereal containers. I realized a container with a larger opening would make catching the lizard easier. 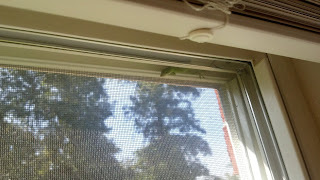 I'm glad the lizard decided to stay at the window while I did this. Hunting it down through the house would not have been fun. 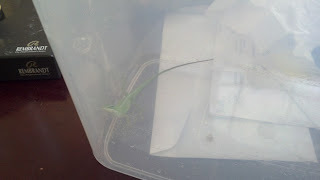 I eventually trapped the lizard in the container. It wasn't very happy about the situation. The lizard also didn't want to leave the container when I put it outside. I had to force it to go run wild again by tapping on the container. 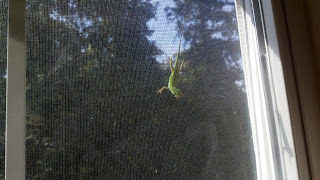 The frame on the window screen seems to be bent on one side, so that is probably how the lizard got through. We'll have to get that fixed soon so this doesn't happen again! Kat is also upset that the lizard is no longer in the window. She just wanted something to play with and possibly eat.